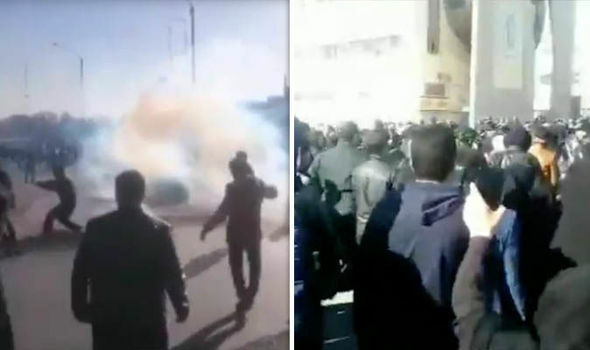 Rallies against corruption in high places spread Thursday from Tehran to sweep up an estimated 50,000 to 60,000 more demonstrators in Mashhad, Urmia near the Turkish border and Arak between Tehran and Isfahan. DEBKAfile, reporting on the rising wave of Iranian popular protest, noted that they are becoming increasingly political. Placards were calling “Death to Rouhani” and groups shouted in chorus: “No to Syria! No to Lebanon! No to Gaza!” and “Corruption is everywhere!” In Mashhad, demonstrators gathered outside the residence of supreme leader, Ayatollah Ali Khamenei’s favorite for president, Ebrahim Raisi, who heads the Astan Quds Razavi, Khamenei’s personal financial organ. The anti-corruption protests first erupted in the capital, Tehran, outside Khamenei’s residence, with the slogan on placards asking, “Where is the money?” It was a reference to the vast sums released to Iran by the Obama administration for signing the 2015 nuclear accord. The government clamped gag orders on the event and ordered the large numbers of Revolutionary Guards officers mobilized to act with restraint and refrain from making arrests. The protests then began spreading. You will become pro Israel the way I did. I realize that ALL Persians and Muslims are WORTHLESS Scum. Forgive me while I go scratch the fleas off my furry back…. Hee Haw hee Haw. Persians saved lots of Jews through out history , you are the ungrateful scum. He is an Israel hating troll telling blatant lies to try to make you hate Israel. ISISrael is not a Jew or Israeli. Parviz: Does the name Haman (from Persia) ring a bell? They did not succeed to wipe out Judaism in the time of Esther but that was not because they did not try. Yes, it goes without saying that there are good people among every group, tribe, sect, etc., but at this time the Islamic State of Iran has made itself an enemy of Israel and has nukes poised to create another Holocaust. Haman was not of Persian extraction, but was an Agagite whose family—long before the time of Esther—settled amongst the Medes. His ancestor (known as Dayukku – a title, not a name) was headman of Ecbatana and vassal of the Assyrian king. Dayukku and his clan were deported to Hamath, Syria, circa 713 BCE. At that point, Jews had been deposited by the thousands in the cities of the Medes for about a decade, with the result being that the Median population had become about half Jewish. Among these Jews were many prominent families of northern Israel, including that of a cousin of Tobit, whose son, Tobias, would travel there and become “dayukku,” and shortly afterward, first king of the Medes. Here is the root of Haman’s personal hate for the Jews. If the Persians were/are so good the the Jews, why are there only about 9000 jews living in all of Iran? Ask any Jew that lived in Iran, life was not actually good there. It is hard to be ungreatful to a person when they try to kill you. You are right – there are academics and Islamists who would like to make out their ugly Islam as a shiny example of tolerance and acceptance, when, in fact, Islam has been a brutal and intolerant cult past and present. Look at what is happening today to Christians in Eqypt…look at any minority group within any Muslim majority and you will find Muslims vandalizing, destroying and killing to get rid of non-Muslims. Who the He!! would want these hate-mongering terrorists anywhere near their countries? You would have to be nuts in the head to invite terrorism. ISISrael Defeated Yet Again: I guess those flees become easily trapped on your hairy back. See a veterinarian right away, Mr. Neanderthal. Now that is a fire I’d like to add some gasoline too. Most repressive regimes fail at some point – the sooner the better for the religious mullah maniacs in Iran who spend all their people’s money on creating an unsustainable Caliphate outside of its borders and occupying and killing the tribes belonging to other Muslims and other people. Apart from inventing better ways for mental defectives to blow themselves up, what has the “great” Iranian “civilization” done to advance mankind in the last 500 years? Who was their Thomas A. Edison, their Jonas Salk? How has the “great” Iranian “civilization” allowed itself to be lorded over for decades by a cult fantasizing about little boys in well bottoms? Haman was an Agagite who are Edomites descendants of Esau. Where’s the money? start with the Ayatollah, who is worth 100 billion dollars. where did he get that? giving lectures about his peaceful religion?